Foods On 'Dirty Dozen' List For Pesticides : Shots - Health News An advocacy group came up with a shopping guide for consumers concerned about pesticide residues in produce. The group's "Dirty Dozen" is headlined by apples, celery and strawberries. The fruits and vegetables lowest in pesticides were led by onions, sweet corn and pineapples. 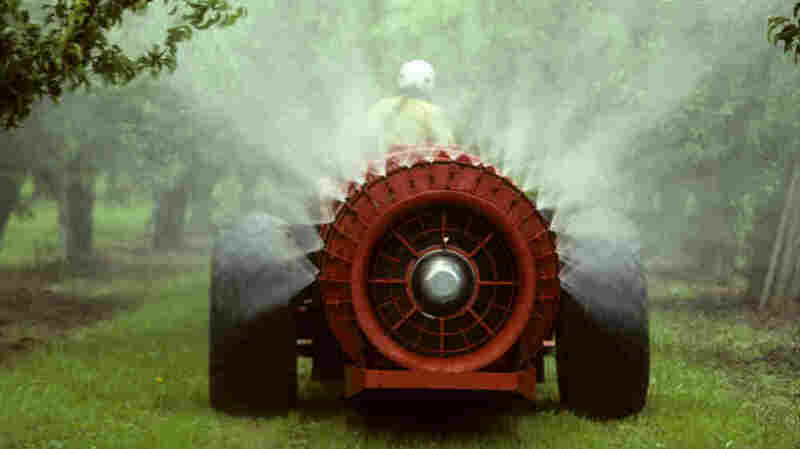 A pesticide sprayer rolls through an apple orchard. There's a "Dirty Dozen," headlined by apples, celery and strawberries. And there's also a catchy "Clean 15" of fruits and vegetables lowest in pesticides. The top three on that list: onions, sweet corn and pineapples. The EWG suggests that people buy organically grown fruits and vegetables for the varieties on its list of the most likely to carry pesticide residues. But the group also says the health benefits from produce mean that "eating conventionally-grown produce is far better than not eating fruits and vegetables at all." Data from the latest USDA report show that 98 percent of apples and 97 percent of grapes tested had at least one pesticide residue. On the other end of the spectrum, only 0.1 percent of fresh sweet corn had a detectable pesticide. But organic isn't necessarily synonymous with pesticide free. The USDA report says some organic lettuce tested contained pesticides. The most common residues were from spinosad (found in 18 percent of samples) and azadirachtin A/B, which USDA says are OK for use in organic agriculture. And the USDA says less than one-third of 1 percent of the food samples it tested contained pesticide residues that exceeded safety tolerances established by the Environmental Protection Agency. Nearly three percent of the foods sampled contained pesticides for which the EPA hasn't set standards, USDA said. Overall, the USDA concludes that pesticide contamination of food is below the limits set by EPA.